It's hard to get all the little details across in a short video, so here is some more background on how we flew with our baby. I know what it's like hunting around the internet looking for useful information, so I want to share my tips with other parents who may be facing their first long flight with their babies. Everyone suggests this because the sucking helps babies' ears regulate to the changes in air pressure, but no one quite explains that takeoff and landing is sort of a long process! It's not just a minute on both ends. It can be 10 to 20 minutes, so you have to time things a bit. Make sure that you don't start nursing until you are really taking off and really starting to land so that you can have enough milk or formula to last the duration. We brought 7 ounces of extra breast milk for the departure flight and had a pre-packaged bottle of formula for the return flight. Even though my baby is exclusively breast-fed, I didn't want to be caught without something for helping his ears regulate. They say that pacifiers also work, though, since it's the sucking action that helps the ears. Our flight was at 6 pm, which is our baby's bed time, and our flight was seven hours, so I really wanted him to sleep as much as he could on the flight. I wasn't sure if Greyson would get that it was bedtime without his routine, so we recreated it on the plane. 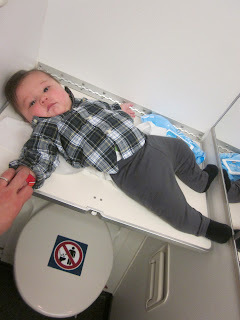 I gave our baby a fake "bath" in the airplane bathroom. I got him down to a diaper and put him on the changing table and put some soap and water on a paper towel and gave him a sponge bath. I don't know if it made a difference in helping him realize it was bedtime, but I felt good about giving him as much of a routine as I could. The timing worked out really well. When I got back to my seat, we read a book to him and then they started taking off. I breastfed because Greyson was hungry before we actually took off, but then I gave him a bottle of breast milk during the actual take off. He fell asleep right away and stayed asleep for the entire flight (it helps that he was already sleep-trained since 14 weeks). His sleeping through the whole flight was the biggest relief and surprise. I didn't know what I was going to do if we arrived in Barcelona at 8 am and he hadn't slept all night. We had hoped to get the bulkhead seat with bassinet, but knowing the plane only had one bulkhead seat and bassinet, we knew it wasn't a guarantee. The airlines give out those seats first come, first served and we got to the airport two hours before our flight, but someone beat us to the bulkhead both times. In the end, it didn't really matter, though. We had a Baby Bjorn and a ring sling with us and I chose to use the ring sling and put him in a cradle hold. I nursed Greyson in the sling on the plane and kept the sling loose. When he fell asleep, I tightened the sling so that I didn't have to use my energy to hold him for the entire seven-hour flight. Having him in the sling allowed me to eat, read magazines, etc. Also, the sling served as a blanket and nursing cover. Planes are cold! I'm glad that our baby was dressed in PJs for the nighttime flight, especially since I expected (hoped) he'd sleep the whole flight. Regular clothes are always riding up and socks are always falling off. You don't have to worry about that when you baby is in footed PJ's. You don't want to have to reach for and lug around a big diaper bag to the bathroom at the airport or on the plane. But a few diapers, a disposable changing pad, a small container of diaper cream and wipes in a gallon-sized ziploc. You can keep it in the seat-back pocket, making it easy to get to the tiny bathroom, where there's no room for a diaper bag anyway. My new policy is that we don't buy toys that can't be connected to a chain, meaning those plastic link things below. Parents seem to spend a disproportionate amount of time picking up toys, but I'm determined to reduce the minutes of my life spend on doing that, atleast when we're out of the house. I love what my husband calls "Circus on a chain" because I can attach this thing to the stroller, the activity mat, the bouncy chair, the jumperoo, and even myself (see below)! I didn't want to be crawling all over the plane looking for stuff. As you can see below, my husband had to do that to look for a pacifier. It was on a clip, but it wasn't clipped to anything. All toys and pacifiers should be connected to something in order to avoid ending up on the floor of the plane looking like my husband. This isn't actually necessary, but we brought peace offerings for our seatmates for our first flight. 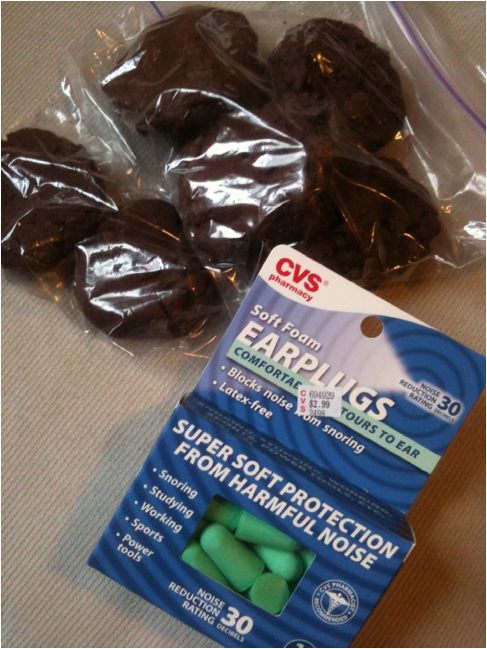 I had made chocolate chocolate chip cookies and bought ear plugs. We were going to give them to the people around us before we took off as a humorous way to address the possibility of a screaming baby. The mom and daughter in front of us loved it and thought it was hysterical, asking if we put something strong in the cookies, like hashish, to help them sleep. The people next to us didn't speak English and thought it was weird that we were handing them cookies and said, no. That was awkward. And the people behind us only seemed to speak Spanish, so we didn't offer. It was just too awkward. Anyway, this step isn't necessary, but I sort of went above and beyond for that first flight since I was so nervous about it. At the end of the day, flying with a baby isn't a big deal at all. Like most things in life, the anticipation was worse than the reality. Flying with Greyson was actually fun because on the return flight, we just got to have a lot of play time with him. Also, the people around us were into Greyson and the flight attendants were all really sweet to us, too. I hope the tips were helpful! The game has changed a bit since my son is now 18 months...it's definitely different with a toddler!